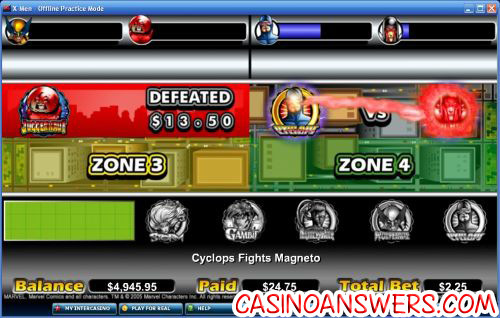 X-Men Marvel Comics Video Slot Guide & Review - Casino Answers! This game features many of your favourite X-Men characters such as Wolverine, Cyclops, Gambit, Rogue, Jean Grey, Nightcrawler, Storm, Professor Xavier, Magneto, Mystique and Sabretooth. The Scatter symbol is the Xavier Institute logo and the Substitute is Xavier. You can play it now at VIP Casino. You can bet $0.05, $0.10, $0.15, $0.20, $0.25, $0.50, $0.75, $1, $2, $3, $4 or $5 per line, making the maximum total bet per spin $45. There is an autoplay feature where you can play up to 99 spins at a time automatically. This is great if you’re not the type to change your bets after you go on a hot streak! No Marvel Comics slot would be complete without progressive jackpots. 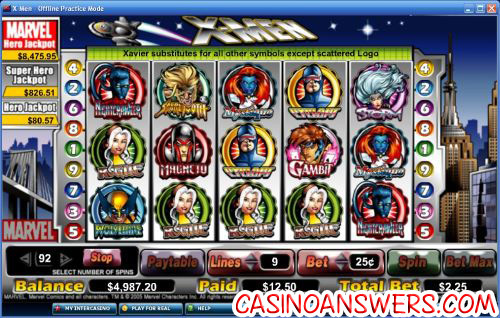 X-Men has 3 – the Hero Jackpot, Super Hero Jackpot and the Marvel Hero Jackpot. These are the same you will find on many of the other Marvel Comics slots on the Cryptologic platform. The Hero Jackpot is in the $100s. Winning it may be something to brag about, but it’s not going to change your life. Then we have the Super Hero Jackpot in the $1000s. If you win that, it’s definitely going to make your day. The Marvel Hero Jackpot is the big one, in the $10,000s. That’s the kind of win that any online casino player dreams of. All Marvel Jackpots are won on the luck of the draw, with no matching symbols required. When you are awarded one of the Marvel Jackpots, animated text with the name of the jackpot you’ve won will appear. Remember, the more you bet, the better your chances are of a big progressive jackpot win! X-Men is a very fun slot machine, especially if you’re a fan of the comics. You’ll appreciate the slick graphics and the sound effects you get when you get a win! If you want to try the X-Men slot machine for free, head on over to VIP Casino! What are the differences between the two X-Men slot machines? The Cryptologic video slot that you can find at VIP Casino is based on the comic books with cartoon-like graphics and sound effects. It’s a 25-line video slot. The Playtech version over at Omni Casino is based on the X-Men movies and is a 9-line video slot. The two games feature many of the same characters such as Professor Xavier, Wolverine, Cyclops, Storm, Nightcrawler, Magneto and Mystique. The differences are the Omni Casino movie version has Lady Deathstrike and Juggernaut, while the InterCasino comic slot has Gambit, Rogue, Jean Grey and Sabretooth. There are also other differences such as the Omni Casino game offering more variation (and thus much higher) in betting options, but both games are a lot of fun and highly recommended if you’re not only a gambler, but a comic geek as well! So if you want to get your X-Men on, head on over to Omni Casino. What is the Marvel Video Slot X-Men? Are there two X-Men slot machines? What online casinos allow you to download the Marvel Slot Machines like X-Men?